Pat Durmon’s third book, Push Mountain Road, is a tribute to the Ozark Mountains, the relationship between ourselves and all that surrounds us, and a life lived fully. 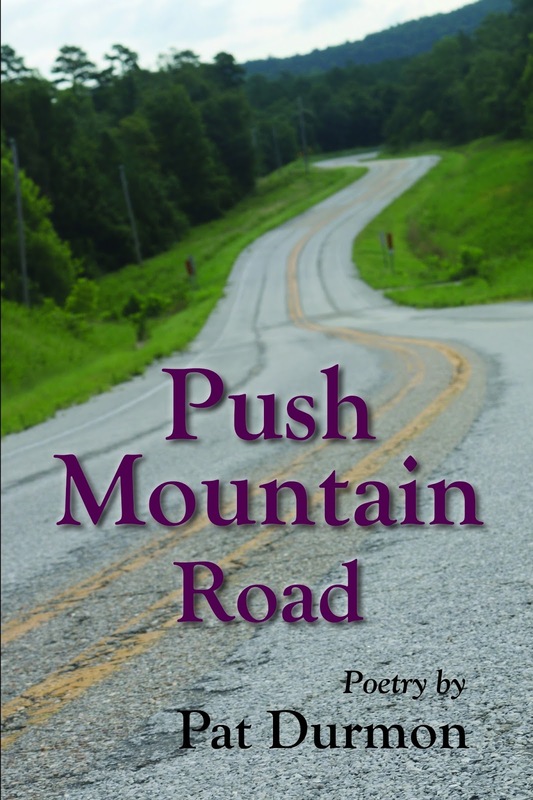 Push Mountain Road by Pat Durmon is actually three books in one, Push Mountain Road, Lights and Shadows in a Nursing Home, and Blind Curves, released from 2007-2015, so you’re getting quite a bang for your buck in terms of quantity. I’m pleased to report, you’re getting top-notch quality as well. Push Mountain Road is, quite simply, a joy to read. Durmon focuses on nature, domesticity and faith. She handles all three deftly, but she is at her best when she is observing the beauty of the world around her. (She lives in Arkansas, which, if you’ve ever been there, you know is home to stunning mountains, hills and forestland.) I adore good nature poems, capable of taking something small and commonplace and transforming it into something miraculous, revelatory, and universal. We have all been enchanted by wildflowers, birds, a clear sky, and these poems assign them the specificity of place. There are poems about the home, about country-living. There is a lot of truth to be found here in ruminations on the day-to-day: marriage, arguments, divorce, aging, a mother in a care facility, funerals, illness, hairdressers. But virtually all of the poems are couched in nature imagery-- an argument pushes up mountains. The falling rain is an epiphany. Newly beautified salon clients walk out, tall as walnut trees. Durmon’s work is imminently straightforward, accessible, yet artful. Her pieces are wise, powerful and meditative, but there’s a playfulness at work here, too, that I really enjoyed. She peppers in words and phrases like flimflam and tra-la-la. She plays with rhymes and alliteration, which, in the hands of a less capable poet can just come off as silly. Here, I think they reflect the poet’s genuine and profound love for life. and the smell of beans humble me. The poems are mature, distinctly female. There has been a lot of discussion lately by feminist writers about how writing that deals with “women’s subjects” has been traditionally dismissed as less important. I would point to Durmon’s poetry as a reason why they matter so much. In “Upholstery Shop,” she quotes the upholsterer, who says, “Welcome to my tiny place where/important work happens.” If this doesn’t sum up literature that deals with domesticity, I don’t know what does. And just because they deal with subjects like cooking and laundry doesn’t mean they don’t have teeth. She finds beauty even in a dead skunk, in the potential of manure. She captures the fury of storms and arguments, floods and funerals. “Hanging” is a gut punch. She is a Christian with the soul of a hedgewitch, capturing the beauty of gardens, kitchens, and the earth at large. One of my favorites was, “How to Build a Mean Mincemeat Pie,” in which the narrator consults a very famous red-and-white cookbook that my mother and I both use, and consults with her mother-in-law on ingredients. I am thrilled to share this experience with other women. “Deep Delight” is another favorite-- a quiet little poem about a single magnolia blossom. I can’t recommend this book enough. Durmon tells me she has a new collection in the works and I can’t wait to read it. 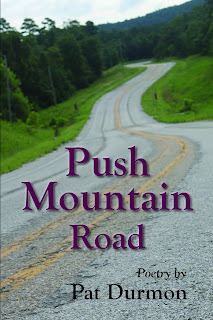 Purchase Push Mountain Road on Amazon. Pat Durmon is the author of Blind Curves (2007), Lights and Shadows in a Nursing Home (2013), and Push Mountain Road (2015). Poems have been published by Rattle, Main Street Rag, Poetry East, Cyclamens and Blades, Between the Lines, Lucidity and other journals. She is the recipient of the Sybil Nash Abrams Award (2007) and the Merit Award (2013), given by Poets Roundtable of Arkansas. Pat Durmon is retired from mental health counseling and currently facilitates two groups. 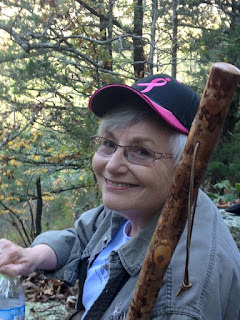 She writes a weekly blog and invites people to follow her uplifting blog by signing up at patdurmon.com. 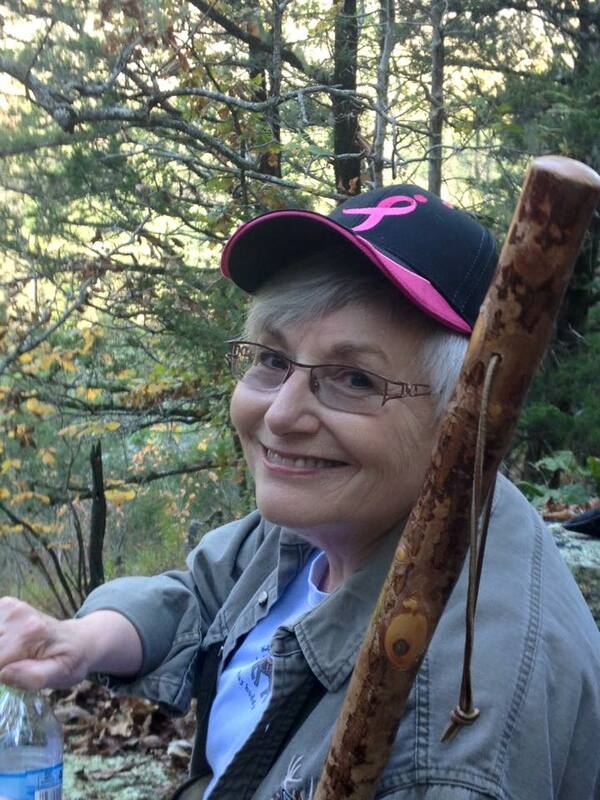 Durmon is a native Arkansan and lives in the Ozarks with her husband. She sees herself as lighter and more joyful after writing a poem.